"I won't lose. I'll work hard and set a new record. 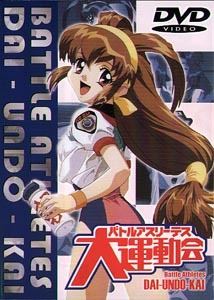 I must..."
Produced by AIC and based on a video game by iPC, Dai Undo Kai, better known to North American audiences as Battle Athletes, was the first sports anime to be released this side of the Pacific. This region three, Japanese only, two-disc set from Odex contains the entire six-episode OVA, and despite being an older series, still holds up as excellent entertainment. After ending a global nuclear war that threatened to end humanity in the early twenty-first century, the human race expanded into space. While remaining at peace for several thousand years, war once again broke out with a race of aliens, however it was fought with unmanned spacecraft, keeping casualties to a minimum. After centuries of conflict that resulted in a stalemate, the two sides agreed that a decisive finale was required, deferring to a one-on-one athletic competition to come up with a victor. Despite their physical superiority, the alien race was defeated, and humankind once again was at peace, but now had reason to pursue a level of physical excellence, and the title of Cosmo Beauty was born. It is now 4999, and the University Satellite, an orbiting training facility, has been created for the human race's foremost athletes, where each year they compete for the title of Cosmo Beauty. The story follows Akari Kanzaki, daughter of a legendary winner of the title, as she tries to follow in her mother's footsteps. There is a problem, however—Akari is far from the graceful athlete her mother was. Instead, she is an awkward girl with little self confidence, and her introduction to the USSA (United Systems Sports Academy) is sobering. She is teamed up with Kris Christopher, a priestess in training from the moon, and Anna Respighi, whose shyness rivals Akari's. She also has to contend with Tanya, an exuberant young girl from Africa, Lahrri, the stoic, and most accomplished upperclassman, and Lahrri's bitter rival Mylandah, who will stop at nothing to win. Along the way, the girls must must face their own insecurities, learn the meaning of team play and friendship, overcoming the tense adversity which is embodied in their competition. They must rise to the obstacles in their paths, from zero-G "Space Ball" to one-on-one "Astro Spike." The road is paved with hurdles, and there can be only one victor. Strength, determination, and a lot of support from their friends will determine the final outcome to crown the new Cosmo Beauty. Dai Undo Kai provides a great story, filled with angst, comedy and melodrama. The character design and animation are very good, and the action sequences build a great sense of competition, that is both interesting and involving, and there is some obligatory fanservice thrown in for good measure. Populated by an expanded cast of likeable characters, the OVAs give decent depth to each player, despite its relatively short running time. There is plenty of emotional impact, as the relationships between the characters are paramount to the series' success, with loyalties tested in the fierce battle to the finish. While many sports-based stories have an predictable outcome, Dai Undo Kai throws a number of curve balls into the equation, with an unexpected finale. All in all it makes for a fulfilling viewing experience, which I can easily recommend. It is worth noting that the full-length television series, Battle Athletes Victory, follows the alternate universe format like many Pioneer titles, rather than just retelling of the OVA. Image Transfer Review: Image quality is for the most part very good. It does have an older look to it, with colors not being overly eye-popping. There is a nominal amount of aliasing, and less rainbowing than its region one counterpart. Some grain is evident, there are a few minor flecks here and there, and a small amount of frame jitter, but overall this compares favorably to the Pioneer release. Audio Transfer Review: The Japanese audio does show signs of age. Compared to the Region 1 release, the sound is distinctly more compressed, the stereo image collapsed, and there is an faint edge of distortion throughout. This doesn't totally ruin the show, but is of decidedly lower fidelity than Pioneer's discs. Extras Review: Aside from six chapter marks opening each of the OVA installments, there are no additional extras. This version of the series does retain the original Japanese credit sequences, which I always prefer, though there are no English credits to back them up. The first discs holds episodes one through four on a dual layer disc, with the final two on a single layered disc. The set comes in a clear case, with additional artwork backing the cover. Unlike some of Odex's releases, the spine art has the Dai Undo Kai title in Romaji. Dai Undo Kai is a fun, entertaining OVA series, capturing the competitiveness of sports, with the emotional ups and downs of friendships and adversity. The show is both charming and heartwarming, with likeable characters and a good story. Odex's release allows those with multi-region players who don't require an English dub a lower cost alternative to Pioneer's Region 1 collection. While it does have a few deficiencies in the audio, this is balanced by superior video, and the original Japanese title sequences.